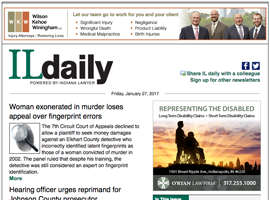 Indiana Lawyer daily will keep readers up-to-date on the latest in the state’s legal news. Delivered FREE to inboxes by 4 p.m. each business day, readers will find links to the latest opinions from the Indiana Supreme Court and Court of Appeals, as well as breaking news as it happens. 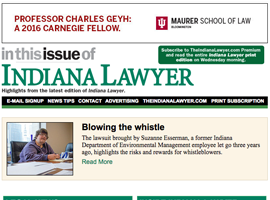 In This Issue of Indiana Lawyer is a free email sent on the morning the newest edition of Indiana Lawyer comes out. It gives readers a snapshot of stories covered in the latest print edition and includes links to several stories.